Rinse poha under fresh tap water and keep it aside for 10 mins. Heal oil in kadai and add mustard seeds into it. Once it splutters, add cumin seeds and hing. Let them crackle well. Add chopped onions and capsicum. Saute it for 1 min or two until onions are translucent. 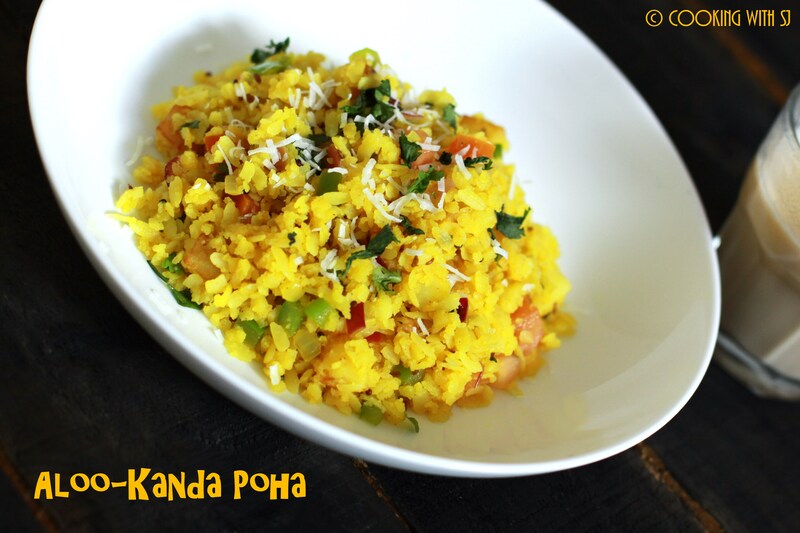 Add rinsed poha along with boiled potato cubes and spices. Mix everything well. Add sugar,lemon juice and chopped tomatoes after turning off the heat. Give a quick toss. Transfer to a serving plate, garnish with chopped coriander and grated coconut. Serve hot with a cup of tea! always good for weekend breakfast.